Ratings are averaged based on 86 reviews. My family and I really enjoyed our stay at Maololo Island Resort. Unlike some other islands in the Mamanuca Islands, kids felt very welcomed at the resort instead of being “in the way”. Kids dined with parents which is what we like to do on our family holiday. The rooms were spacious enough for the 4 of us, and even the “island view” rooms had ocean views. No TV and no in-room wifi really provided us all with a technology detox. The resort only caters for 40 odd rooms so we felt like the staff knew everybody on the island by name. They adored the kids and it just provided a nice atmosphere around the resort. Special mention to the head chef and his team who went out of his way to cater for my daughter who has numerous food intolerances and made her meals outside of the regular menu. I can’t thank him and his team enough. The only areas of improvement I can suggest is there isn’t a lot of planned activities. We were on the island for 5 nights and I saw 1-2 planned activities by the beach the whole time. The other thing was breakfast. Lunch and dinner was so delicious it made breakfast seem a bit substandard. The buffet is only continental which is FJD$29 for adults and FJD$20 for kids to have cereal, fruit and toast. You can order hot food but is on top of the continental breakfast, you can’t pick between the two. Outside of that it was a great resort, great location, friendly staff and a beautiful location. I’d highly recommend it as a destination. An awesome family holiday - the best we've had so far! 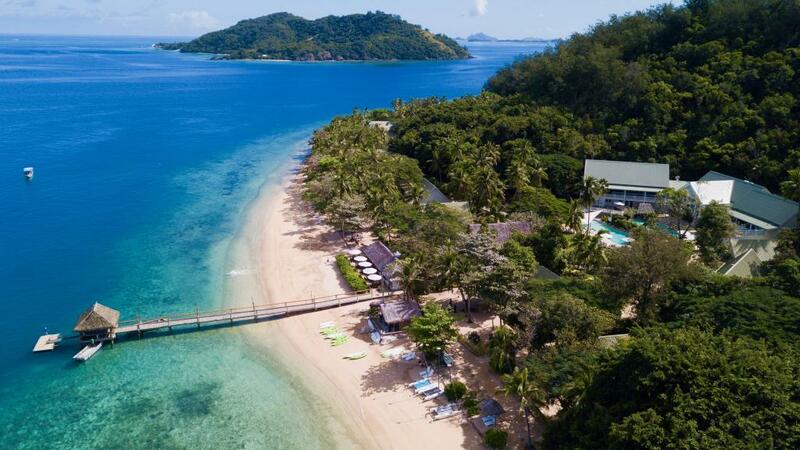 Malolo Island Resort was the perfect place for a family holiday for those with young children. The island is small and therefore the atmosphere is friendly and personal. Staff were always friendly and many remembered us by name. The facilities were lovely, the food was amazing, the free watersports were excellent, the beaches were beautiful, snorkelling was awesome, and most of all, the kids club was brilliant! Kids had a wonderful time and were well-cared for by the amazing staff. We were able to enjoy family time as well as some grown-up time each day and also some lovely dinners in the fine dining restaurant - just the two of us. All in all it was the best family holiday we've ver had! We didn't want to leave! The kids loved it! The staff were so friendly and quickly got to know our kids by name, and really knew how to make them feel special. Take the snorkling trip around Honeymoon Island! Everything was perfect and the service and welcome on the Island is wonderful. Superb with children. This was our 2nd stay at Malolo island resort. It truly is a wonderful family holiday resort. The location is beautiful, accomodation is comfortable, food is great (especially for Fiji - which is notoriously average) however what sets Malolo apart is the staff. They make you feel so welcome and really embraced our kids. The relatively small size of the resort encourages interaction among other guests - both for the adults and the kids - lots of good times and laughs at the beach bar! Highly recommend. Great food, friendly staff and snorkelling right off the beach! A truly unique experience in the best way. The most organic family holiday you could ask for. Definitely re-visiting!!! Great for families. Beautiful staff. My wife and I with our two kids aged 10 & 8 just spent a fabulous week at Malolo Island. I cannot think of a single complaint. The staff were wonderful, the accommodation and the dinning were both excellent. There were more than enough activities to keep both our kids on the go for the whole week. I couldn't recommend it enough as a family holiday destination. What a beautiful resort. The family facilities on this island are exceptional. My child could not get enough of all of the kids club activities and the nanny service is five star. As a foodie, we rated the food quite highly. Our only suggestion is a different a menu for Treetops but you also have 3 dining venues to choose from, all of which are great - some of the better food we have sampled in Fiji. Great value for money, book this resort for your family you will not be disappointed. See you again Malolo. Malolo has got better and better over the past few years. Grounds and buildings are in pristine condition. Our ocean view room was beautiful. The main buildings are beautifully maintained. We were overwhelmed by the service and the feeling of being home. Every staff member is friendly and nothing is too much trouble for them. They are amazing with children and there is a real feeling of love for kids. We had great weather and kayaked, snorkelled and island hopped. We also checked out the surf location, Ocean Break. Food was great and is a highlight of this resort. We loved our return visit. Best family holiday we've ever had! Wonderful experience. We have a 7yr old and a 4yr old and found this resort knew how to cater for everyone in the family. We were so impressed with the friendly staff and service. Food was excellent, and the snorkelling was just beautiful. Would definitely recommend it to anyone!! Accommodation, dining, resort staff and management - all exceptionally good. Although we are an older couple we really enjoyed having such happy families around us. Totally relaxing stay, would go back in a flash. Beautiful location. Staff are very friendly and will make you feel at home. Rooms are spacious and very nice. If something isn't quite right they'll fix it for you. Plenty of spots to find a quiet area with a beach chair or hammock even when the resort is full. It's a very relaxing place to stay even during school holidays when there is lots of kids. You'll be too relaxed to notice. I'd like to go back one day in the future. A fantastic kids club, happy parents. A very friendly resort. Fantastic kids club, great chef. Parents actually had a break. If you are looking for a Bali-type holiday complete with night clubs etc...then do not visit malolo..if you are looking for total relaxation among wonderful people then this is exactly the place to come and we have lost count of the number of our visits ! The combination of the people and the location made this family Christmas one to remember. It is hard to imagine a more beautiful and laid back setting. So much to do and yet no need to do anything. A beautiful island paradise, and all the staff were a pleasure to meet. We were welcomed as returning family, and treated like Royalty. Beautiful people. My second visit and it was even better than I remembered and I didn't think that would be possible. Just loved it. We felt our 6 night stay was not enough so we tried to extend our stay in paradise on the spot (unsuccessfully as the resort was full). The resort caters mostly to families with kids and sometimes with grandparents. Our family of 5 (2 adults & 3 kids aged 12, 9 & 6) stayed in a Deluxe Oceanfront Bure. Our kids all enjoyed kids club as there was a separate program for the older kids. They enjoyed fun activities including snorkelling on a nearby sandbar, speed boat trips around the island to visit local villages & a school, a bonfire on the beach, crab racing & touch rugby on the sand. We all relaxed together by snorkelling off the resort beach (in a fish reserve) & reading on hammocks in front of our Bure. We enjoyed kid free dinners at the resort's Treetops adults only restaurant. We received a wonderful welcome by resort staff, made friends with them & other guests & shed a tear when we left when staff came to the jetty to sing the Fiji Farewell song. we have just returned from an outstanding trip to Malolo Island Resort. We traveled as a family with our nearly-two year old son. Everything was wonderful - our bure was lovely, right on the beach, and the rest of the resort was beautiful and immaculately maintained. But the staff were the amazing - so wonderful with our son and all of us. We were made to feel like family and the service was incredibly warm, friendly, professional and not over the top. The food was of excellent quality. We were so sad to leave - we will definitely make this our family holiday destination for the next few years. Best family holiday destination in Fiji. Loved it and will be back again. Had the most amazing relaxing stay. Idyllic, beautiful, relaxing, yet still with plenty of things to do. Loved the service, location, accommodation and the gorgeous Fijian people. Our family of six (kids 4-9) thoroughly enjoyed our stay at Malolo and won't be looking for another resort if we return. We had a prepaid meal plan including kids eat free, which worked out well for us and we were impressed at the quality of the food. Kids club was good for early primary aged kids but many children opt out, and our four year old didn't like it so much. It seems busiest at night. Rooms are beachfront and beautifully serviced, staff friendly, and gardens and surrounds carefully maintained. Bar prices are high. The best thing about Malolo for us was the free availability of non-powered water activities, and we and children loved snorkelling off the beach (abundant wildlife on show right there) and kayaking and paddle boarding options. 3rd visit and it won't be the last. Malolo Island Resort never disappoints. Fantastic staff, clean rooms, great food, crystal clear water, so many familiar smiling faces that remember you. Genuine hospitality we've never experienced anywhere else. We even island hopped to some nearby island resorts to compare and boy were we glad that we were only visiting those ones. Malolo Island Resort wins hands down. See you soon. We have been to Malolo three times now over the last five years and every time it seems to get better. The long serving staff makes it feel like coming back to family every time we go there as they remember how children and their names and their kids remember them. And amazing resort with all of the five star facilities that you would expect that without feeling like you are just another number . We needed a family break, we needed time to reconnect and relax and Malolo Island surpassed our expectations. Our room (33) was OUTSTANDING with what I think was the most incredible view of all bures though a slight walk with an an overtired 4yo and an 18mo but managable for the view, oh the view! The food at Treetops was above and beyond all expectations and worth it to have a 'date' with the amazing nannies looking after our 18mo for Dinner/Bath & Bed time. Miss 4yo couldn't get enough of the kidsclub. We kayaked, we snorkled, we 'Bula'd and Vinaka'd' everyone and had a truly memorable stay in every way. The only thing we would do differently is I would try to pre-order a meal for the night of arrival. After travelling all day and the only option being a buffet on the Saturday (Fiji night), our meal and welcome was a disaster and we hardly ate and it was an expensive exercise). Start afresh the next day and it would be a lot more relaxing. We will ABSOLUTELY be back as soon as our budget allows. Friendly and intimate, clean and pristine resort where service is at the fore. Amazing snorkelling on your doorstep and the most magic of sunsets to be seen from the bar deck over a cocktail or two. Will definitely return home to Malolo. This island is fantastic for everything. The food is unbelievable, the treetop adult only dining experience is first class. We have dined in some top hat places in Australia and treetops food and service is well above this. The kids club is excellent, our kids did not want to leave there from morning until night. The activities they do from village visits, glass bottom boat trips etc were great. This island is a must with the best service and friendly staff who remember your names. We will be back. As a family with a very busy schedule we don't get the opportunity to holiday often so it was critical to make sure what we booked was a good fit for our family. Our kids are water baby's so there had to be plenty of ocean action, we needed to relax so the accommodation had to be luxurious enough for an island stay and there had to be a variety of quality things to eat. Malolo delivered in spades on all aspects. When I read the reviews mentioning paradise i was a little sceptical but paradise is a fitting description of this beautiful resort. Before visiting Malolo reading reviews of people returning for a second, third or forth time, I didn't think I could return to the same place considering the few holidays we take and the expense involved but upon my return to Sydney my opinion has been changed, I can't wait to return to the wonderful people at Malolo. Malolo was amazing for our family of four (5&7 year old). The snorkeling was the best I've ever done and surpasses some of the other Fiji Islamds I've stayed at. The service was perfect and the staff made great efforts to know you and ensure your stay was pleasant and provided whatever was needed to ensure this was the case. The grounds are immaculate and everything was perfectly managed. Kids Club was great for our kids with a variety of activities on and off the Island to keep the kids busy. Malolo is a fairly small resort but that's exactly what we were after. We are hoping to return with the kids as an annual holiday! Having been to Fiji many times we loved discovering Malolo - tad more low key with so many activities and dining options won us over. We will be back ! The staff were fantastic and made our stay so enjoyable. Our teenagers clicked with the activities personnel who made sure there was something to do all the time. The musicians took music requests from our teenagers and accommodated them with their rock and roll dancing. The food staff catered for our fussy daughter and the room staff were fantastic. There was lots of things to do and the food was fabulous. Cant wait to come back! Every day was perfect. Lovely staff, fantastic kids club, very relaxing day spa and always something to do ( if you want to) and plenty of day beds, deck chairs and hammocks if you want to relax. Love love love Malolo! 5 Stars! We had an amazing time at Malolo. The resort is stunning and so well maintained. The staff are the friendliest most attentive I have ever come across at any resort. Nothing is too much trouble, they are always smiling and friendly and fabulous with the kids. It doesn't matter what position the staff are in, they all were lovely and attentive to my children and other children on the island. My kids are aged 10 and 8, they enjoyed the kids club but wanted to spend most of the time swimming and snorkelling, sailing and paddleboarding. The food is the best I have had in Fiji, very fresh and seasonal with a different menu each night. We had such a special time, the kids miss Malolo so much.....we are busy planning our next trip back soon. Water beautiful. Views amazing. Beach bar excellent. Central to all day trips. Staff simply the best! All bures have beach views. We had a fantastic family holiday. The staff were super friendly and we were given a tour of facilities when we arrived. They have great free non-motorised water activities and lovely bures on the beach. It was very quiet even when at full capacity. The kids club activities involved visiting turtles, the local village and joining different cultural activities. We will be going back to Malolo Island. Welcome home! Wonderful stay, thank you for sharing your lovely island with us. Amazing staff. We will be returning next year. We enjoyed great weather, superior hospitality, fabulous fine food, a relaxed atmosphere, & plenty to do if you so chose. A superb resort where the enthusiam of the staff really shines through & where hardly an hour goes by without hearing beautiful melodious singing from two or three of them at a time. Wonderful Week ! We had the best time and wonderful weather on this beautiful island. The staff were generally super friendly and helpful - lovely people. We loved our stay at Malolo with our 2 kids aged 9 and 11. The resort is beautiful, the family bure is huge and pure luxury, the snorkelling was wonderful (recommend the Castaway Wall trip), the food was delicious, the service was excellent, the staff friendly and as there are only 45 Bure it was lovely and peaceful. We will definitely be back. From the moment we arrived we felt welcomed and at home. The bure, food and activities were all fantastic. Great to see a resort with an unforgettable warmth from the staff. Thanks for all the great memories and hope to return again sometime. Fantastic Holiday. Staff were friendly, happy and always accommodating to individual needs. Bure's were kept nice and clean. Food was world class 5star standard. Resort facilities were great too. Cant wait until we go back. The staff go out of their way to make sure that you and the kids have a wonderful holiday. So accommodating, I loved the snorkelling straight of the beach, the fantastic kids club and the delicious food the most. A fabulous place for a family holiday with plenty to do for the kids at kids club allowing some well needed time out for the parents! Great location and staff, we will be back! Quiet and makes you relax. Food exceptional. Sake, the resort manager along with his incredible staff including the kids club staff, Freddy and the head chef Kete make your stay a pleasure. Facilities and location are second to none. A resort where you can do as much or as little as you want. Food at Tree Tops restaurant is to die for whilst the buffet at the Terrace certainly fills you up. Couldn't fault the staff or resort. Will definietly return. We had a very enjoyable stay. The resort has fantastic staff and a great variety of food. The kids loved the pool, snorkeling out front of resort and made some new friends. Modern and clean rooms (bures), 25 steps from the beach, family vibe, nice beach (not as stunning as the Yasawas but certainly much better than the ones in Nadi). Staff was very friendly. Highly recommended. The local people are so warm and genuine. The location was spectacular, water was warm, coral and sea-life were abundant right from the beach, food was excellent, and accommodation and facilities were idyllic. All in all the perfect holiday and more than we could have asked for. Lovely, friendly, happy place... We never wanted to leave! I'm sure you could have a wonderful time just about anywhere in Fiji. But I'm also sure that none of them would be as fabulous as a stay at Malolo. The food, rooms and staff were fantastic. The kids club and the way kids are treated at the resort is phenomenal. The watersports were great - the snorkeling right at Malolo's beach was incredible! The spa was pure bliss. In short, this was a perfect trip for our family. This resort was the most amazing we have ever stayed at. We have been very lucky and have travelled to many different places, including a large number of island resorts, but this one was by far the best. It is the first time ever, we actually want to go back to the same place. It was worth every cent and there was not one thing to complain about. The staff from the fancy restaurant to the kids club manager were amazing. We needed a doctor, and that was no trouble. I could go on and on about how wonderful it was, but go there and see for yourself! We loved every part of our Malolo stay. Staff were incredible, food was amazing and the resort and the surrounding area was paradise. We will be back! A great family holiday (although you don't need to have children to enjoy) BUT for the young ones (especially under 10) it is ideal!! The people there are so lovely and kind. We loved it!! Fantastic stay. Service fantastic and friendly. We really had a great time at Malolo, plenty to do with activities as well as restful if you wanted. The staff are fantastic and always welcoming. We will return. Great sized rooms, food fantastic and great service. so relaxed and the service was amazing! It was our second stay with a young family. Pituresque Malolo Island with great relaxed atmosphere and wonderful service. Babysitters took the kids to the kids club, we snorkelled, scubered, relaxed and didn't want to leave. The staff learn your names and are super friendly. Could improve the coffee though. Paradise location! What a spectacular place!! The most accomodating, friendly, happy and helpful staff. Worth every moment and every cent....we didn't want to leave. The rooms and grounds were exceptional in presentation...no rubbish, no mess...just fabulous and a credit to the staff! Get off Denarau people and go to this place and support a place that is still owned by Fijians. Malolo was everything and then some - not overcrowded, super friendly service - where Bula is ALWAYS said WITH your name!! The food was spectacular...always fresh and always presented as 10star!!! We stayed here for 3 nights and found the accommodation and service excellent. We took the meal deal and it was very good value. We especially liked the fact that we could eat in any of the restaurants. The staff were really lovely and got to know our names quickly which made our stay so much more personal. We were surprised to see so many young families with little children and would've preferred more couples. Having no TV was also a different experience but the free wifi in certain areas was good value. We were blown away by how amazing the staff were. We felt like they were our extended family. We had a wonderful stay at Malolo Resort. The refurbishment was amazing. The main dining area is a grand colonial structure. The daily changing menus in the Terrace and Treetops Restaurant were exciting and delicious. Our family had a relaxing stay. We will definitely go back. The staff made the experience very warm and welcoming. Nothing was too much trouble for them. This resort was really beautiful and the service and management very helpful and friendly. Great for families or couples. Has been recently renovated and bures are very tastefully decorated and comfortable. They thought of everything down to the minor details. Very good value for money compared to other resorts we have stayed at in Fiji. Malolo is a beautiful resort and small in size which suits us. Highlights were the dolphin tour where we spotted hundreds of dolphins who swam around our feet; the snorkeling and swimming off the wharf; food at the adults only restaurant, Treetops; bures; location. Downsides were the confusion over all inclusive and non inclusive packages and that the kids club closes twice during the day. We all had a brilliant time and will definitely consider returning to Malolo! From the moment you step onto the jetty and are greeted in song by the staff, you immediately feel connected to Malolo Island. What a magical place. A fabulous destination for families. Beautiful, friendly, very sad to have to leave! Beautiful resort, wonderful staff, recently rebuilt after the cyclone so accommodation and facilities are wonderful. Would love to go again! We didn't want to leave!! Amazing Place - mostly due to the Amazing Staff and the ideallic location. The recent $4.5M rebuild is evident and totally fantastic. As soon as you step off the boat you feel like you are home. The staff take the time to learn your names in the first few days and nothing is too much trouble. Rooms were cleaned daily and had a great environmental policy with replacement of linens and towels. The food plan is a little complicated but our accommodation package included "kids eat free" so we went with the pay as you go option and feel like we came out well in advance (as we took some food with us). The only downside is that the walking tracks weren't all cleared from the cyclone but that wasn't a big issue as there was plenty of things to do if you wanted to. Overall we didn't want to leave! Malolo was wonderful and such a wonderful experience for my husband and I. Everything was beautiful, from the rooms to the delicious food (your choice of three different restaurants each day to eat from), the range of activities, the beautiful snorkelling sites close by and amazing friendly staff. It was a little pricey, so if you're on a budget you might want to stay for a couple of nights or mainly enjoy snorkelling and the other free water activities. The priciest things to do there were the water sport activities, which can add up quite quickly, so choose the ones you want to do and leave the rest for another day. We had a great experience there and would recommend Malolo to anyone in search of a beautiful relaxing holiday! I will definately be going back! Malolo is beautiful! The staff are so friendly & can't do enough for you! Food, accommodation, service, activities.....everything was fantastic! My wife and I had a very happy time at Malolo. Exceptional staff ensured nothing was too much trouble. Plenty of eating options, many complimentary activities, free WiFi! and very good snorkelling outside the spacious, well appointed rooms. Efficient arrangements for Scuba diving. Great resort for either families or couples. The quality of the resort and location was exceptional. It was small enough and self contained so that it had a village atmosphere. The staff very extremely friendly and accommodating. The kids club, with an excellent daily program, kids meals and kids pool made it perfect for families. The meal plan was good value and excellent yours and activities can be arranged through the resort. I would definitely stay there again. This package booked via tavelonline was excellent value for the amount spent. Enjoyed the holiday very much. Beautiful location as well. A brilliant location with great snorkelling right off the beach. Very picturesque jetty. The best treehouse style kids club in Fiji.